Rumors start pouring in regarding the much speculated next iPhone i.e iPhone 8.The latest rumor surfaces from Chinese research firm TrendForce. The report gave more details about the iPhone 8 and also confirmed some of the features that surfaced in earlier rumors. According to its report, the new iPhone 8 will be powered by 3GB RAM and will come in only two storage options 64 GB and 256 GB. TrendForce issues reports on D-RAM and other memory components so the forecasts made by the firm tend to be accurate. 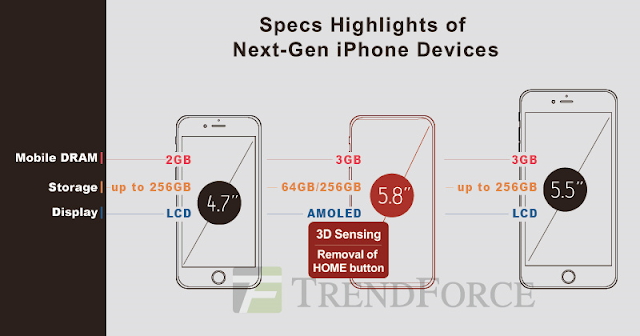 Last year TrendForce accurately predicted the storage capacities of iPhone 7 and iPhone 7 Plus which it stated to be available in 32GB,128GB, and 256 GB. The increase in storage space will be a boost for users who find the entry-level iPhone models with less storage rather annoying. iPhone 7 started with a data capacity of 32 GB which is higher than the previous versions wherein iPhone 6 started with 16 GB. According to the report, iPhone 8 will come with slightly curved 2.5 D curved glass rather than much speculated 3D Glass owing to production and drop test issues with 3D glass. TrendForce further reported the replacement of physical home buttons with touch buttons as rumored earlier. So iPhone 8, may have the home buttons embedded in the display itself. But there was no mention of the much-hyped wireless charging feature. Apple recently became a member of wireless power consortium and there was much speculation that new iPhone 8 will come with wireless charging as speculated initially by KGI analyst. 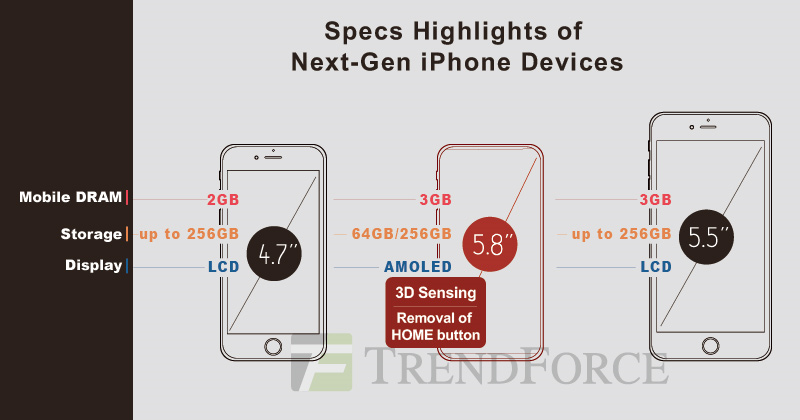 The firm further speculates iPhone 8 to incorporate 3D sensing technology that can be used for facial recognition and augmented reality features. The report further says that iPhone 8 will sport 5.8 inch OLED display and the model would cost over $1000 as reported earlier. There are two more models said to be unveiled along with iPhone 8. One model with 5.5-inch display will have 3GB RAM similar to iPhone 7 Plus and the other model will sport 4.7-inch display and will be powered by 2 GB RAM. Both these models will come in storage capacities to include up to 256 GB and will be priced less than iPhone 8.